Light Emitting Diodes (LED) uses a standard semiconductor to generate light in different colors. Organic Light Emitting Diodes (OLED) uses an organic polymer or plastic semiconductors to generate light. They produce light on their own, do not generate heat, and are thin and flexible. OLEDs are currently used as display units in small devices such as mobile phones, digital cameras, and MP3 players. Not to be confused with LCD screens, these type of dispaly screens do not need to be backlit with LEDs or lamps. The original kind of LEDs, introduced in the early 1960s, used a conventional semiconductor to generate colored light. 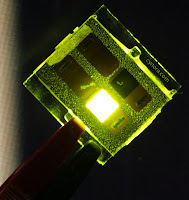 Newer organic LEDs or OLEDs – with an organic polymer or "plastic" semiconductor to generate light – have become increasingly common in the last decade, particularly for displays in MP3 music players, cellular phones and digital cameras. OLEDs also are expected to be used increasingly for room lighting. Big-screen TVs with existing OLEDs will hit the market later this year. A new "spintronic" organic light-emitting diode glows orangish (center) when the device, chilled well below freezing, is exposed to a magnetic field from the two poles of an electromagnet located on either side of the device. University of Utah physicists report inventing the new kind of LED in the July 13 issue of the journal Science. The new kind of OLED invented by the Utah physicists also uses an organic semiconductor, but isn't simply an electronic device that stores information based on the electrical charges of electrons. Instead, it is a "spintronic" device – meaning information also is stored using the "spins" of the electrons. Invention of the new spin OLED was made possible by another device – an "organic spin valve" – the invention of which Vardeny and colleagues reported in the journal Nature in 2004. The original spin-valve device could only regulate electrical current flow, but the researchers expected they eventually could modify it to also emit light, making the new organic spin valve a spin OLED.